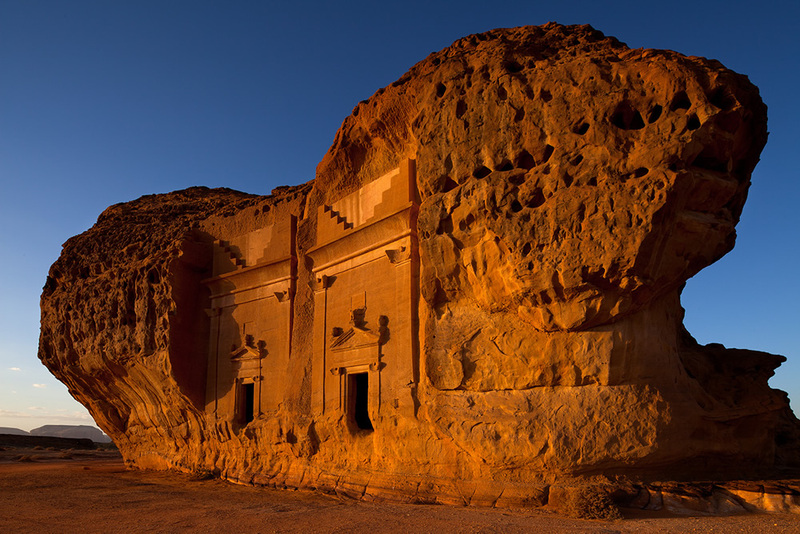 Mada’in Saleh, not far from al-Ula (22 km), was known as al-Hijr, or Hegra, by the Nabataean people who carved its magnificent tombs into the golden Quweira sandstone outcrops. The delicate details on the entrance portals and the smooth surfaces of its 111 tomb façades reflect the great skills of the masons of their time. The splendor of the natural setting here must have reminded the Nabataeans of their capital, Petra, hewn into the rosey sandstone cliffs to the north in modern-day Jordan. It is no wonder that they chose this very spot to build their second city, Hegra. 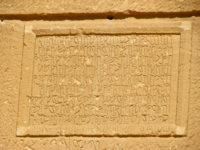 Based on the many dated tomb inscriptions, Hegra thrived between 1 BCE -74 CE. The Nabataeans began as pastoral nomads, raising their sheep, goats, and camels in the desert as so many other Arabian tribes have done through the millennia. They also practiced oasis agriculture, utilizing a set of wells dug into the rock. Their origin is uncertain, but there is a strong possibility that they came from the Hejaz region of northwest Saudi Arabia. The deities they worshipped were similar to those honored by ancient cultures in that area and the root consonants of their name – n, b, t, w – occur in the early Semitic of the Hejaz. From early in their history, they had connections with Mesopotamia and may have been the Nabatu Arabs mentioned by the Assyrians in the eighth century BCE. Alexander the Great’s officer Hieronymus of Cardia wrote of the Nabataeans as having an ascetic life with harsh laws. They were also known for their incredible familiarity with the desert and their ability to fade into it to evade enemy tribes. Their system of hidden cisterns dug deep in the interior provided water for their livestock and their people. The real cause of the success of the Nabataeans, however, was control over much of the spice trade. Frankincense, myrrh, and other spices from southern Arabia were brought up to the north along trade routes to be purchased by the Greeks, Romans Egyptians, Phoenicians, and others around the Mediterranean and in the Near East. The Nabataeans built their empire as the middlemen. Hegra was a crossroads where the major north-south incense route intersected a road from the Red Sea to the Persian Gulf. 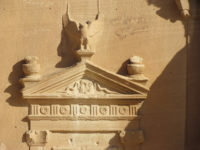 The tomb façades are finely carved and fairly uniform in their style. At the top of most is a pair of crowsteps rising up from a central point. One or two cornices are just below, resting on the delicate capitals of two pilasters. A portal in the center of the façade provides the entrance to the tomb. Inside are recesses carved into the walls where the bodies of the deceased were placed. The interiors remain roughly chiseled in stark contrast to the smoothly finished façades. Qasr al Bint, “Palace of the Daughter or Maiden,” is the largest tomb façade at Hegra, with a height of 16 m. It lends its name to a group of adjacent tombs. The portal is raised above ground. 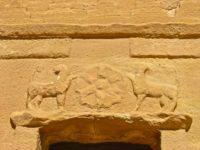 Above the doorway is an inscription plaque saying that the tomb was carved by the sculptor Hoor ibn Ahi for Hani ibn Tafsy, his family and descendents, in the 40th year of the reign of the Nabataean King Aretas IV (al-Haritha), dating it to circa 31 CE. The Jebel Ithlib is a monumental outcrop topped with a complex of spires in the northeastern part of the site. 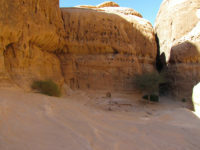 In the middle is a natural slit that measures 40 m (131 feet), called the Siq, after a similar corridor at Petra. At its entrance, to the right is a square chamber containing three stone benches that served as a triclinium for sacred feasts. Today, the chamber is known as al-Diwan (court). Its large entrance suggests that the feasts extended into the open space before it. In the middle of the Jebel Ithlib is a natural slit that measures 40 m (131 feet), called the Siq, after a similar corridor at Petra.